Giving children the best start in life begins with breastfeeding. Breastmilk is the natural first food for newborns. It provides children with necessary nutrients for their growth and development and protects them from deadly diseases such as pneumonia and diarrhoea. There is no better substitute food for a breastmilk. A breastfed child is 14 times less likely to die in the first six months than a non-breastfed child, and breastfeeding drastically reduces deaths from acute respiratory infection and diarrhoea, two major child killers. The longer breastfeeding is delayed, the higher the risk of death for children in their first month of life. This year when the world celebrates breastfeeding week (1-7 August) emphasis has been made on breastfeeding and its importance to achieve Sustainable Development Goals (SGDs). 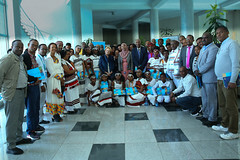 Here in Ethiopia, when the event was celebrated at the Ministry of Health the State Minister of Health, Dr Kebede Worku, said that breastfeeding has an ‘all rounded’ benefit that keeps children healthy, happy and more productive at later age. He also stressed that mothers need to be supported to breastfeed their children both at home and in the workplace. 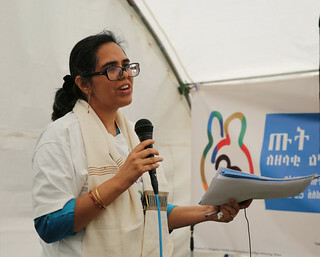 UNICEF Deputy Country Representative to Ethiopia, Shalini Bahuguna, on her part said “optimum breastfeeding to children under six months is an effective resilience measure.” She also underscored UNICEF’s commitment to promote early and exclusive breastfeeding by engaging fathers, religious leaders as well as members of the community. According to UNICEF, early breastfeeding rates in sub-Saharan Africa have increased by 19 per cent from 1995 to 2011. This is the highest rate when compared to other regions. It is estimated that 41 per cent of children in sub-Sharan Africa are exclusively breastfed. 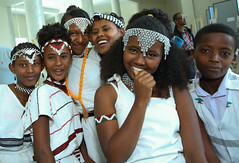 When it comes to Ethiopia, the numbers are encouraging. 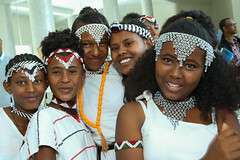 Ethiopia is one of the leading countries with 52 per cent of children exclusively breastfed within the first six month. But still there is a long way to go as the country has high stunting rate. Early and exclusive breastfeeding helps children to survive. That is a fact. Yet, breastfeeding is also linked with national development. Evidence shows that the benefits of breastfeeding extend into adulthood. A well breastfed child has good sensory and cognitive development which is associated with better educational achievement. Healthy and better educated children will be more productive and positively impact socio-economic development. Breastfeeding also contributes to poverty reduction. It is a natural and cost effective way of feeding which do not burden household budget as compared with formula feeding. Thus, supporting breastfeeding is the smartest investment nations can make to ensure the wellbeing of their citizens. It is, therefore, critical to promote optimal breastfeeding and provide support to mothers who have social and commercial pressures that compromises their decision to breastfeed.